Yoni Chockalingam has uncovered new evidence of the living vibrance of Hinduism and the unbridled innovation of free enterprise. In every Hindu household there is a shrine for the family deities, in the West it's the refrigerator. Ganesh, the destroyer of obstacles and the paragon of western thought, Mickey Mouse have, through recombination, joined into one deity -- Mickey Ganesh. With the obliteration of obstacles, free market forces are, at last, liberated to unleash their potency on our globe. Icon for the ages -- Mickey Ganesh has devotees in the millions, most of whom are unaware of their passion for this icon of consumption. East and west, both are on the cusp of a new revolution; A revolution that will eliminate the horror of banality, unrelieved toil and nascent navel gazing. 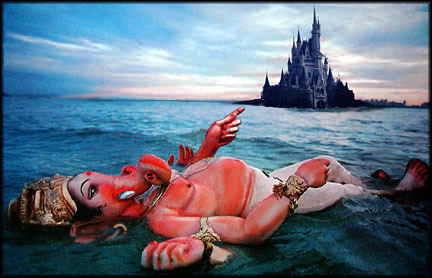 With each Deity having temples in their respective lands, the merger of Mickey and Ganesh is a "ready made" adding authority to post-high-postmodern theory, permission for yet more additions to the body of knowledge. "For the best of all possible worlds choice is the one force that drives the need to have needs. So many choices -- so many needs, the invisible hand is the best hand for demanding supply  supplying demand." Pointing his way toward his new homeland Mickey Ganesh has floated across the ocean to join other dieties to become the putative new leader of globalization and theologic unification. 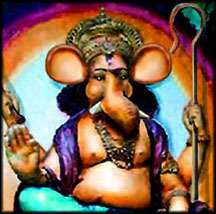 Ganesh, the destroyer of obstacles and Mickey Mouse, the paragon of western thought, have, through recombination, joined into one deity -- Mickey Ganesh. With the obliteration of obstacles, free market forces are, at last, liberated to unleash their potency on our global awareness and prosperity. place for the family deities, in the West it's a refrigerator. With the persistence of doubt -- there is an ongoing Kultur Quest to merge and consolidate the need to believe. Tom Friedman has long forecast this synergistic amalgemation for global agape. "I am convinced of the potiency of Mickey Ganesh as our final diety for humanity to rest its trust." ex-lover, sibling, son, daughter, father or mother? What can you send your boss? Great Idea! Ill send the Mickey Ganesh Unicard  Perfect for all occasions. your most intimate associates, partners and those birthdays, anniversaries, coronations and other occasions that bedevil us all. The Unicard for those in less favor. greeting. 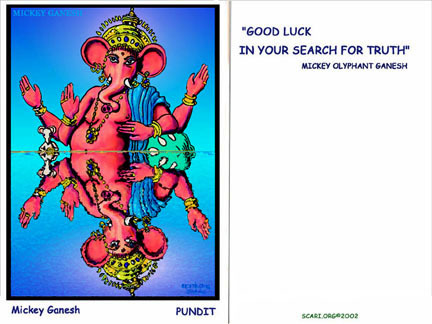 Mickey Olyphant Ganesh is the perfect card for all seasons. 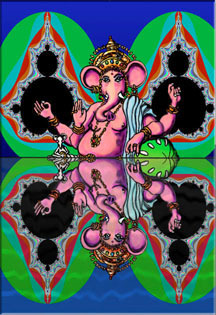 Mickey Ganesh merges east and west into a unified belief system. Hinduism and Disneyfication have become an undeniable global force. Mickey Ganesh is the perfect gift or an Icon suitable for your own home. Matted and sealed in sturdy plastic ready to slip into the 8"x10" frame of your choice. This print is air tight -- perfect for bathroom, kitchen, in the kids room, your personal shrine or office. In the beginning he was just a twinkle in Sai Baba's eye and a smile on Michael Eisner's face, but now he is, he just is. Some say Mickey Ganesh is a manipulation of Pop Icons for public consumption, others believe the time has come for a diety that all peoples can believe in, all lovers of wonder can find a place in their heart for  the true Global Citizen Mickey Ganesh. Quizzical Icon, Religious Masterpiece or Cult Classic. Matted and sealed in sturdy plastic ready to slip into the 8"x10" frame of your choice, this print of the pundit is air tight -- perfect for bathroom, kitchen, in the kids room or your personal shrine. 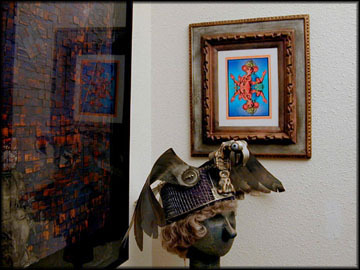 Mickey Ganesh is a limited edition of 5,000 -- A collectors edition. In conjunction with Walmart Stores, Disney Inc. is integreating all lands into one land for the safety, benefit and entertainment of the consumer to enjoy a sense of wonder.